Mexico has a number of cities that offer pleasant daytime temperatures and cool, pleasant evenings in the summer. Mazatlán is not one of those cities. Summers in Mazatlán will offer you splendid sunsets and rollicking thunderstorms. They also will have you sweating in crevices that you didn’t even know could sweat (knuckles sweat?). The humidity is so high that I wake up to stair railings and tile floors that are glisten with moisture. Ultimately, early morning is the time to work-out, take walks and otherwise seize the day in coastal Mexican towns and cities. Two things make living with Mexico’s coastal heat different from living in Miami, New Orleans or Houston. First, air conditioning is used more sparingly in Mexico. If a store or restaurant even has it, the air is often set at barely-tolerable-degree Fahrenheit. Saving electricity is an obsession in coastal towns in Mexico due to the way electricity is billed. 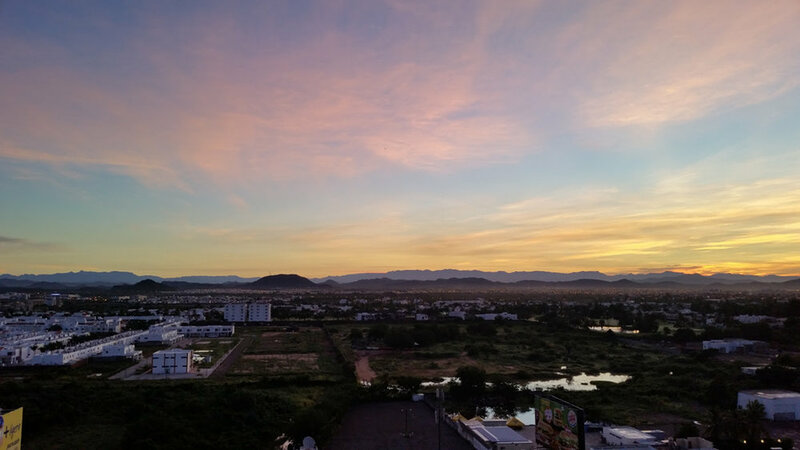 You will hear horror stories of $800 (that's dollars U.S.) run up by some expat who didn't read up, like this account from my very own Mazatlán. Rooms in homes are individually cooled. You move from room to room turning mini-splits on an off. Just when you cool off, you have to start dinner. The other factor is the salt in the air. Mazatlán has some of the saltiest air in the world. In the kitchen, potato chips go soft within hours, garlic salt hardens and the glue on packaging disintegrates so quickly that the cereal boxes in grocery stores have to be taped together. Even in September Mexican coastal towns have plenty of hot days ahead. But there are ways to stay cooler, especially women (or very secure men) beyond the usual admonishments to drink a lot of water and wear light clothing. Use an umbrella. I was surprised how much cooler it was under an umbrella. Using one always make me feel like I'm channeling Coco Chanel. Hand Fans (the Spanish kind) - An entire summer went by before I rediscovered folding fans. Spanish and Mexican women still use them with aplomb in their countries. A language partner of mine in Spain keeps one in every purse. Only last week she snapped out a glorious purple one she used the whole time we talked. Awesome. At any group gathering like concerts, you will see hundreds of them, like so many colorful butterflies. If you think this is bad, you should see me after the work-out. In the 14th century, the use of the fan developed into a secret language used by women to communicate with young men since women were always chaperoned. For example, a woman touching her nose with her folded fan meant she thought of him every day. I once met a guy at the immigration office who fielded the idea of inventing the “man-fan,” bringing to mind images of mud flap graphics, leather threading, and eye contact that might be hard to let go of. Even inexpensive hand fans are pretty. You can buy a few at the vendor stalls in any Mexican plazuela. to keep handy for when the breeze suddenly dies or the window on a bus won’t open. Frozen rolled wash cloths - I got this idea from a yoga instructor who brought them for the savasana after hot yoga classes. Soak the washcloth in water with a few drops of essential oil, like lavender or peppermint. Roll it up and put it in your freezer. Before you go to the gym or a warmer outing, take it out and put it in plastic bag to take with you. In about an hour, the cloth will be perfect. You might just complete your work-out without having a stroke. Electrolyte drink sold in even the most humble of shops. Same thing goes for water. Freeze half a bottle of water. Before you leave for the day, fill the other half with the cold water from a pitcher in your refrigerator. It should stay cold at least an hour or so. Frozen grapes in the freezer are good to keep as a snack and last forever. Fruits can be blended with a little agave syrup and poured into ice cube trays for healthy frozen snacks, a great way to use past-prime fruit. Don’t walk around at noon. The buildings walls provide no shady side at high noon. Replace electrolytes - “When you get older, you sweat less.” At least that is what experts write. Reading this, I believed myself no longer capable of producing the torrent that I now achieve regularly when I go to the gym in Mexico in the summer. Sweating like that depletes electrolytes. Symptoms of imbalance include weakness, twitching and…seizures. Older people are particularly susceptible because they have more problems regulating their body temperature. You can buy bottles of premixed electrolytes in even the most modest store, but the cheaper option in Mexico is powder that is sold for babies that you mix yourself. The author at play in the summer. Coca - Cola's - Forget all those terrible things you read about how bad Cokes are for you. I am sure that doesn’t apply here in Mexico. Offcially, the urban myth that Coca-Colas are different in Mexico has been debunked, but oh, watch me writhe in ecstasy after that first draught. Ha-ha-ha (or as they say in Mexico, 'ja ja ja"). You'll learn. Coca-Cola sells more of their product in Mexico than any other country. Go into any convenience store early in the morning and you'll see a line of day laborers with their 1.75 liter-size bottles in one hand and their plastic container or re-fried beans in another. When you see Mexicans like these doing things you think are wrong, rest assured - There is a damn good reason for it. They are descendants of an almost ancient culture, with mysteries and secrets we are only now just beginning to understand. The final tip: Throw yourself naked into your pool. My expat friends Oscar and Mary (especially Oscar) swear by it. You’d be doing it anyway. You’re in Mexico. In time, your need for the sight and sound of the ocean (and Coca-Cola) every day will become so great that you will accept the heat, humidity and clothing hanging on the line as stiff as a saltine cracker. I have come to relish the sweat fest in Mexico in much the same way I used to when I was a mountain-biker in Snowshoe, West Virginia, wringing sweat and mud out of my jersey several times in a day. Rather than take the ski lift up and doing only fun downhill riding all day, by riding up the mountain at least once, the exciting downhill rides became something I earned. I’m not sure I’d be happy swooping into Mazatlán for only for the cooler high season from November to May with the snowbirds. Maybe we all have a little bit of Mayan in us that demands human sacrifice. In the summer, the thunder storms are as exciting as the days are hot. Why I love being here in the summer. Next up: Mexican courtesy and my never-ending quest to be queen for a day. Hola! 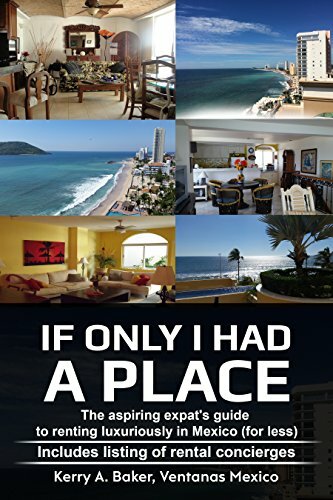 I'm author of "If Only I Had a Place," a new book on renting and my first love the "Interactive Guide to Learning Spanish Free Online" and a partner with Ventanas Mexico, which provides insights and resources for those considering full or part-time expat life in Mexico. 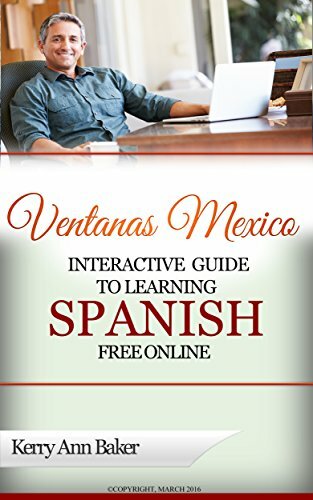 The "Interactive Guide" links you to the best free online tools with sample lesson plans and information regarding why a second language is the best thing you can do for your brain. Learning a language takes time. Why not get started today? Study from your laptop, tablet or e-reader.